With the flipped classroom model, or blended learning, faculty use various approaches (such as readings, short videos, and web resources) to present new information rather than relying on traditional in-class lectures. Students are exposed to the new content outside of class and come to class better prepared for deeper processing and using the new information through active learning and more authentic activities such as discussion, problem-solving, debates, and other activities involving analyzing, evaluating, and creating. 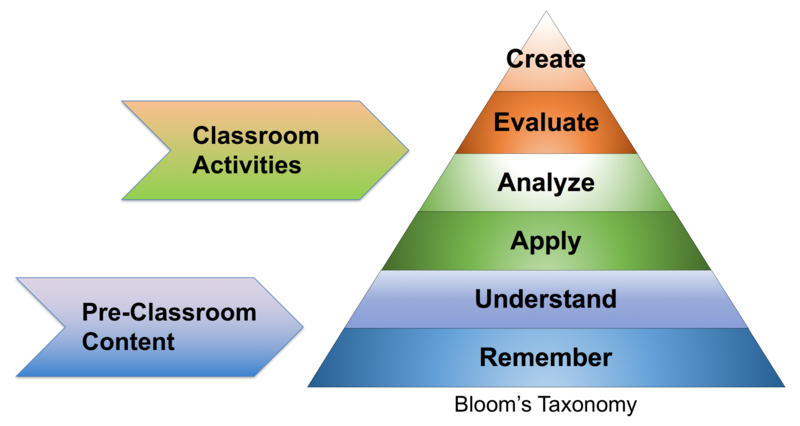 If we examine Bloom's Taxonomy (2001 revised), students must first memorize (Remember) then describe or explain (Understand) new knowledge in the cognitive learning process before moving to higher levels of learning. With a flipped classroom design, students can achieve these lower levels of learning outside of class, then achieve higher levels of cognitive learning through active learning in class. Flipping The Classroom- Vanderbilt University.